An Executive Summary is a brief summary of the business so that people can understand what it is about at a glance. An executive summary is a statement located at the beginning of a business plan that highlights its main points and key takeaways of your complete business plan. The information in an executive summary includes a description of your business, the “problem” your company solves, your financial and resource needs moving forward, and what, specifically, you are requesting from readers of your plan. Why is it called an executive summary? 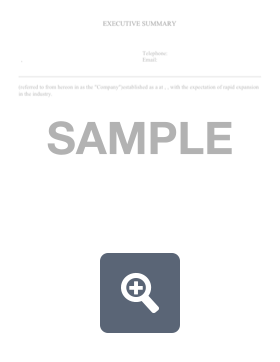 The name refers to the section's purpose, which is to provide a birds-eye view of the contents of the entire document. The summary works to both introduce the key points of the entire plan and to entice readers to keep reading. It also functions as a quick and easy resource section for readers in a hurry. Who you are and what you are offering. What product/service you offer and what the adjoining benefits. Include your business’ name, where your business is located, and where it was established. Make sure it's compelling. Remember, this is the first thing the reader encounters, so grab their attention. What is the problem your company solves? What is the value of your products/services to the customer? What is the market and growth opportunity? Why now? Here you need to address why investors should invest now and why the timing is appropriate. Who is your customer? Be sure to include data about the total size of the market and the opportunity within it. What separates you from your competition? What is your competitive advantage? How innovative and unique is your business idea? How does your business “solve” the problem you identify? Be sure to detail how you will take your product to market and generate revenue (for the business and for the investors)? Provide value to select customers by addressing a problem through a value proposition or unique selling position. Proof of Solution: Why is your team the right fit for this endeavor? What financial proof or projections do you have to prove it? What are the financing requirements and profitability? What are the risk analysis and mitigation measures? Remember: investors invest in the team behind the startup, not just the startup’s idea. What has your company already accomplished? For example, revenue increase, awards, recognition, lead generation, increased market share, etc. What do you need from readers (capital, advising, etc.)? How much money do you need and how are you going to spend it? Investors want to know immediately if your startup’s financial plan falls within in their normal funding range. How you allocate funds makes a huge difference depending on risk. Exit strategy: You do not have to provide all of the details, but briefly summarize how and when investors will receive their return. Be sure to consider all elements of your company that should appeal to investors. 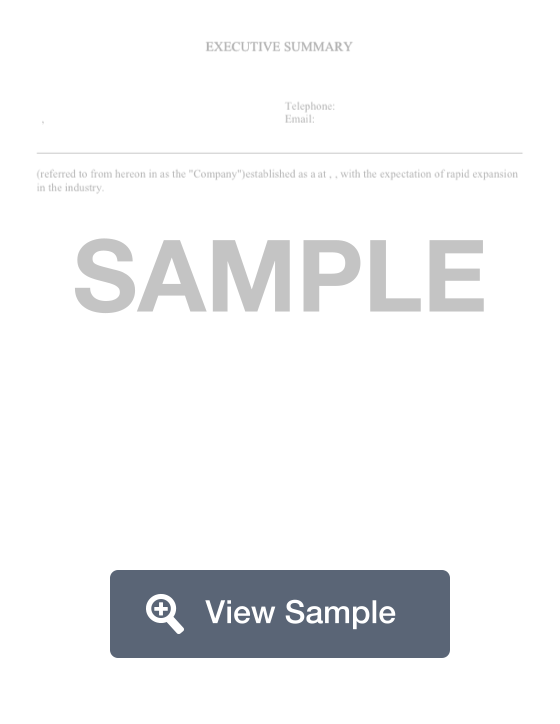 Here is our guide to crafting an executive summary of your business plan. This guide walks you through how to craft a strong one. We also cover the differences between a business and research plan and detail the components of a research summary. With this information, we think you’ll have all the information you need to write the proper executive summary of your business plan. How do you write an executive summary? Even if you are not seeking investors, a strong executive summary can serve as a distillation of your company’s goals and principles that you and your team can return to as needed. The summary can help your company develop and provide a ‘jumping off point’ for future business plans. It can also serve as a course for business summaries, websites, marketing campaigns, etc. An executive summary should be concise. This means no more than two pages (ideally a single page). A common formula for an executive summary is 5%-10% of the length of the entire plan. Numbers: Round numbers off wherever possible to make them easier to understand. You should also use charts or graphs to simplify the data to make it easier to comprehend. Don’t spend too much time on the history of the company. You will cover this later in the plan, so keep your company’s history short. Write the summary after completing the rest of the business plan. Doing so will make the section easier to write and ensure you include all relevant information. Capture the reader's attention: this is your chance to grab your reader’s attention. Make sure you demonstrate a clear path to success and support your claims with facts. The summary should appeal personally to the audience and should be adjusted based on who you are presenting it to. Did you partner with universities, agencies, organizations to gather research? Who were the primary team members? Is this research part of a greater (national) research program? How did you conduct the research (briefly)? How long did the research take place? Was this process compatible with other research? What findings do you want to highlight? How did you collect the research data? Be sure to frame this in a manner that generates interest in how you arrived at these findings. Demonstrate the benefits of the research and outline the associated costs of completion (and possible savings of the outcome)? Benefits to the customer, before and after comparison, costs, investment, productivity and how you will quantify the results. Communication: How and where will the research results be distributed or published? Solution: What issue does this research solve? Whether you have a small business or a large company, bankers like to see the personal net worth of business owners. This not only gives them an idea if you can pay back their loan but also shows your financial management. While investors may be interested in potential growth, bankers like to see your financial history to gain insight on how you’ll manage the funds they loan you. Bankers like to see stability, as it ensures they’ll be paid back. Although they are typically not very long, executive summaries are probably the most important component of your business plan. Hopefully, this guide has provided you with all of the information and guidance you need to write a strong plan that will entice investors to read the rest of your plan and ultimately fund your business. 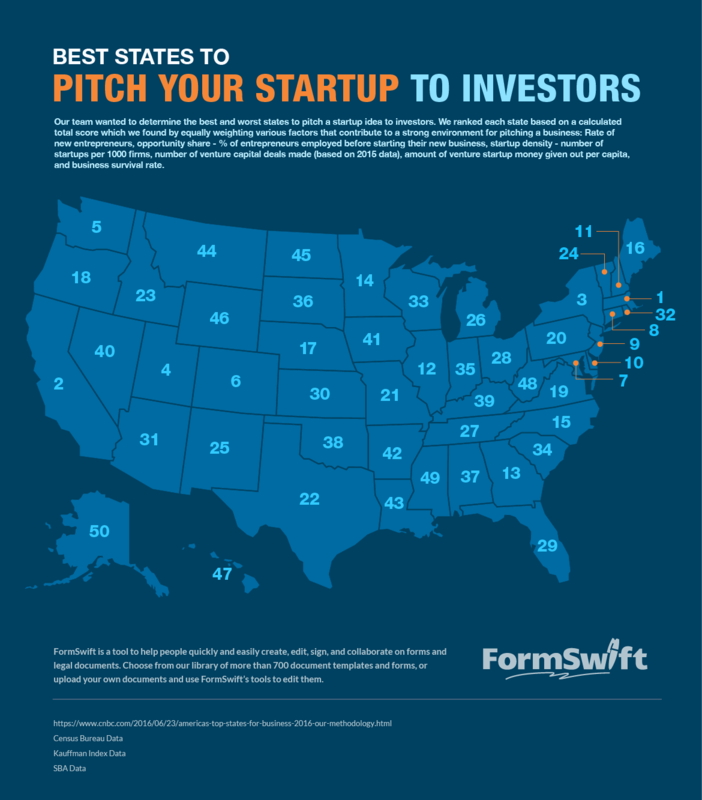 Our team at FormSwift wanted to determine the best and worst states to pitch a startup idea to investors. We did this by creating a ranking based on a total score that we calculated by evenly weighing the following factors that contribute to a strong pitching environment: Rate of new entrepreneurs, opportunity share, percentage of entrepreneurs employed before starting their new business, startup density, number of venture capital deals made (in 2015), amount of venture startup money given out per capita, and business survival rate. The top 5 states for pitching your startup to investors are Massachusetts, California, New York, Utah, and Washington. The bottom 5 states for pitching your startup to investors are Wyoming, Hawaii, West Virginia, Mississippi, and Alaska.